By the time I finally got round to seeing JJ Abrams' monster movie Cloverfield it was already well past its sell-by date. Found footage had been used and abused so many times it was hard to remember that it and The Blair Witch Project had once seemed as innovative and ground-breaking for their movie-making style as they had for their marketing campaigns. 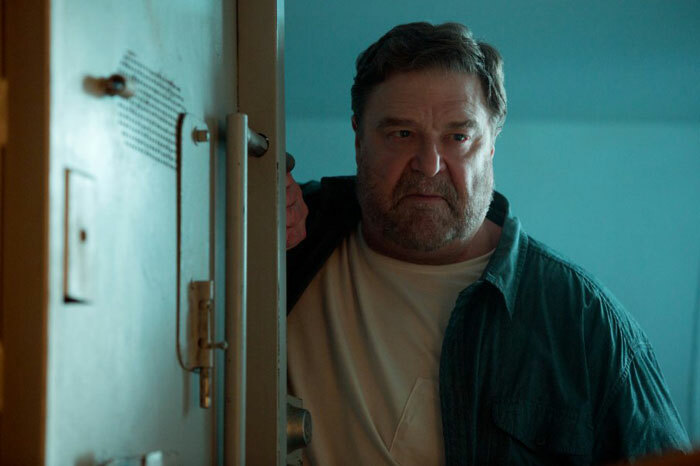 10 Cloverfield Lane however – not so much a sequel or prequel but a companion piece I'd say – is not a found footage movie, thank goodness. For starters, in its post apocalyptic world there are only three people left to film anything anyway and nobody else to find it. Or is there...? When twentysomething Michelle (Mary Elizabeth Winstead) wakes from a car crash, she finds herself deep underground in a Texan doomsday bunker. According to her saviour – or is he her captor? – she has narrowly escaped a huge nuclear/chemical explosion which has left the outside world toxic and devastated. Or has it...? You get the drift... and I'm going to stop with the dot dot dots before I spoil this really rather splendid and hugely enjoyable movie for you.